I have noticed a plethora recently of damaged and otherwise less-than-perfect Chinese porcelain on auctions like Ebay. There are only a handful of dealers who sell these items constantly. They guarantee the items to be geniune to the period they claim to be from. I recently purchased a small blue and white bowl (see pics) for about $11, mostly out of curiousity. All of the pieces I've seen have problems-- mine has some deep scratches and a cracked top. Others have a great deal of pock marks. The bowl I bought was supposedly from the Ming Dynasty. Is it possible that the claim is true, and that this was just an ordinary peasant bowl that is worthless to dealers because of its poor condition? I think a lot of your readers would find this answer fascinating -- especially those who buy on Ebay. Anything you could tell me about this piece would be very helpful. At that price, it's hard to believe anyone would go through so much trouble to make elaborate fake damage. If they are geniune, then it's wonderful to be able to have a small piece of history at minimal cost. It is nice, charming and looks rugged enough to be authentic, still I am not convinced. To explain what I am thinking about, I will first need to tell that I usually would not have had any problem accepting that an ordinary peasants (min yao) bowl could have been excavated at some long forgotten kiln site and found its way to eBay at this price level. From an economic standpoint the price you got is fine even if the bowl turns out to be somewhat later then we might want. 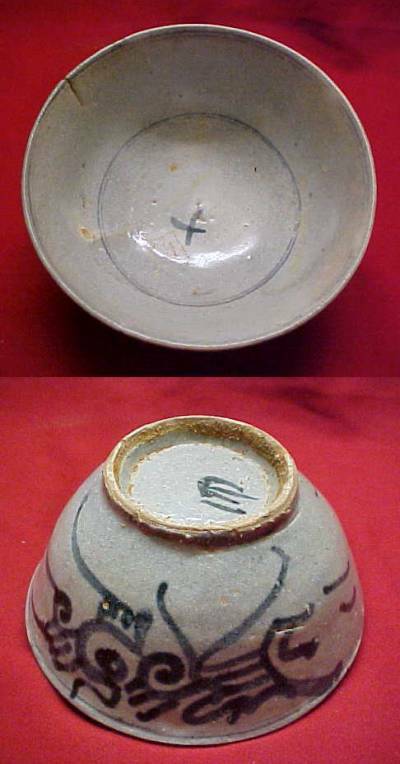 Now, I have not followed the auctions at eBay for quite some time - so I don't know if it is possibly that they have started to reproduce even damaged kiln rejects, but unfortunately I must say that I do not really recognize this bowl as a Ming design. This might just be me and I don't know this for sure. I just got surprised by all the damage features this bowl manage to show at the same time. It even got lots of kiln grit around the foot rim, which was usually avoided at all costs and only occurred at very short periods since the customers specifically didn't want that. The problem for me right now is that as I see it, even a damaged and rejected Ming bowl would have been in better condition. However, it is quite possibly to find kiln rejects for sale at very low prices and I can only agree that it is quite fascinating to have an old piece of porcelain whatever the condition. From a historical point of view even the rejects have a story to tell. Regarding the possibility to make intentionally rough looking kiln reject fakes I do think that is possible though. Ten years ago when I visited Jingdezhen in China - where most Chinese porcelain was and still are being made - hand made blue and white replicas - in perfect condition - could be bought at US cent 25 each. From this I gather that it is not impossible that the cost of intentionally making low quality "kiln rejects" would still be something similar. To make an unsuccessful porcelain bowl have never been much of a problem for the Chinese potters, the problem has always been to make a perfect one. I don't know if this answer has been of much use to you. To sum up my impression - yes - even kiln wasters are available at this price level and quite interesting for their history. If this one is a modern made up reject, I don't know. If it is from Ming - I don't think so - but it could be from the mid 19th century and still look old. Then the condition still surprises me. All in all I still think it would be interesting to have this bowl discussed in a larger group, since - IF - this happened to be a new made up "kiln reject", I think that would be a big surprise for a lot of people. Readers are encouraged to email me your thoughts on this and any further information you might have, to je.nilsson@gotheborg.com.